Tests commissioned by the Environmental Working Group of four mothers and their daughters found that each of the eight women's blood or urine was contaminated with an average of 35 consumer product ingredients, including flame retardants, plasticizers, and stain-proof coatings. These mixtures of compounds found in furniture, cosmetics, fabrics, and other consumer goods, have never been tested for safety. A substantial portion of the chemical burden inherited at birth by the daughters in this study will last for decades; some will last a lifetime. In turn, the daughters can pass on to their children some of the same molecules of industrial chemicals that they inherited from their mothers. The mothers in this study, however, probably received far less inherited pollution at birth. Instead, they accumulated their pollution over a lifetime, as members of the first generation of parents routinely exposed to commercial chemicals like flame retardants, plasticizers, and stain repellants. 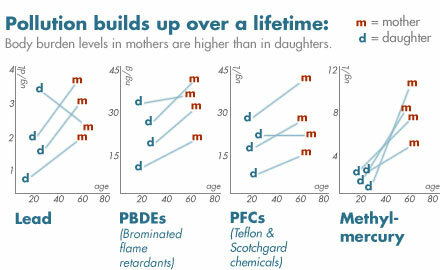 The estimated age by which a daughter will purge 99 percent of the inherited pollution found in this study ranges from one day for phthalate plasticizers, to one year for mercury, to between adolescence and 60 years for common flame retardants and stain-proofing chemicals, to longer than a lifetime, 166 years, for lead. And while each daughter begins life with an inherited load of pollution, she also continues to build up additional pollutants through childhood and beyond. Chemicals that persist in the body were found at higher levels in mothers than daughters, showing that chemicals can build up in the body over a lifetime, posing long-term, persistent health risks. Mothers harbored in their bodies an average of 1.5 to 5.2 times more pollution than their daughters for four chemicals or chemical families: lead, methylmercury, brominated flame retardants, and the Teflon- and Scotchgard-related perfluorochemicals known as PFOA and PFOS. The mothers and daughters in this study join 64 other people tested in six EWG biomonitoring programs conducted between 2000 and 2006, including a study published in July 2005 of 10 newborn babies with an average of 200 industrial pollutants, pesticides, and other chemicals in each child (EWG 2005). In total, EWG biomonitoring has found 455 different pollutants, pesticides, and industrial chemicals in the bodies or cord blood of 72 different people. By any measure this is an astounding number of contaminants — a burden of pollution that is made even more troubling by the lack of health studies or safeguards for their individual or combined toxic effects. The pressing need for change. Exposures in early life heighten concerns over health risks from these exposures. EPA studies show that children from birth to age two are 10 times more sensitive to carcinogens than are adults (EPA 2005). A new study from UC Berkeley shows that children may be up to 164 times more sensitive than adults to neurotoxic pesticides called organophosphates (Furlong et al. 2006), and innovative research from Washington State University demonstrates that chemicals can confer toxicity four generations after exposure, by forcing permanent, heritable changes in gene expression that can change the body's ability to metabolize and excrete toxic chemicals (Anway et al. 2005). National Children's Health Study. In a recent act of irony, the Bush administration presented the well-deserved, prestigious "Children's Environmental Health Champion Award" to Dr. Philip J. Landrigan, a longtime children's health researcher and advocate from New York's Mt. Sinai School of Medicine, just months after submitting a budget to Congress that would cut off funding for the seminal children's health study he was to spearhead. This pivotal project aims to track health and chemical exposures for 100,000 children from birth to age 21, and would dramatically expand our understanding of children's environmental health. Research like the now jeopardized Children's Health Study would yield the powerful, raw data needed to spur significant advances in scientific understanding of the health risks from childrens' inherited and accumulated exposures. California Biomonitoring Program. The California Legislature is considering a bill, SB 1379, that would establish the first state program to track pollutants in people. The program would help state health officials better understand the relationship between chemical exposures and increasing rates of disease, track the impact on public health of emerging chemicals of concern, and identify communities disproportionately impacted by chemical exposures. Gov. Arnold Schwarzenegger vetoed a similar bill last year, and the chemical industry is again lobbying furiously to kill it. But proponents believe the emerging science on chemicals in the human body, and Californians' overwhelming support for the right to know what chemicals are in their bodies, are bettering their chances this year. Federal Kid Safe Chemicals Act. In 2005 Congress responded to the science of body burden with a bill that would fill many of the gaps that leave public health at risk when it comes to chemical exposures. The Kid Safe Chemicals Act (S1391 and HR 4308), the first major update of 1976 Toxic Substances Control Act, was introduced in the Senate and House in July and December 2005, respectively. This dramatic rewrite of industrial chemical law would require companies to document the safety of chemicals before they go on the market, and, most importantly, would require that chemicals be safe for the fetus, infant, and other vulnerable populations — a simple, commonsense idea completely absent from current federal law. All of these measures, if passed and implemented, would dramatically advance our understanding of health impacts from chemical exposures, and would go a long way toward sealing the gaps that leave mothers, daughters, and others at risk from the human body burden of industrial chemicals.